“Small cheer and great welcome makes a merry feast,” wrote Shakespeare in the The Comedy of Errors in 1594. The same rings true 423 years later. A well-crafted welcome series is a virtual extension of a warm (un-clammy) handshake, embracing your new prospect into the fold and inviting them to feast upon the fruits of your product range. People that read at least one welcome message read more than 40% of their messages from the sending brand during the following 180 days, according to a recent study by Return Path, so it's clear how important it is to get things right. 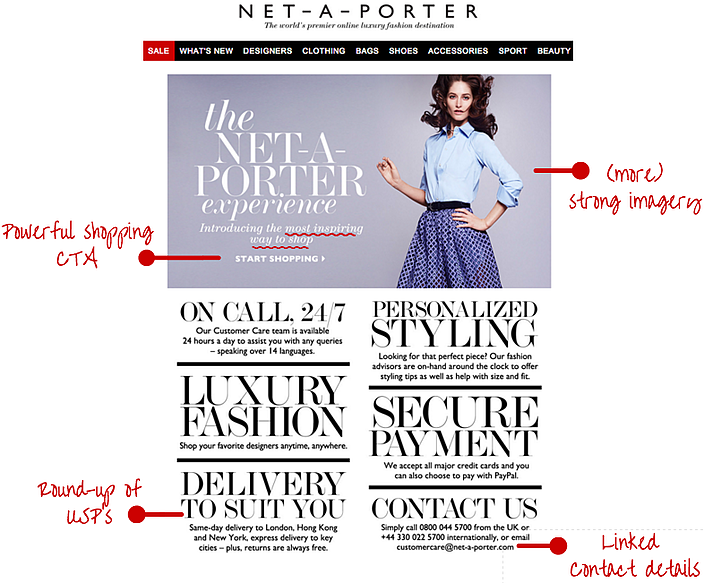 We’ve singled out this awesome welcome series from NET-A-PORTER for turning a humble email into an online opportunity to build trust, earn respect and score sales. First things first: make sure your welcome series conveys the breadth of your product offering and clearly links to your brand. Inserting your website navigation bar into your email is a simple but effective way to ensure your new subscribers are immediately aware of your entire product proposition (and can shop straight away). Strong product breadth and navigable toolbar. Strong imagery and glossy editorial style captures attention and asserts NET-A-PORTER's fashion credentials from the very beginning. 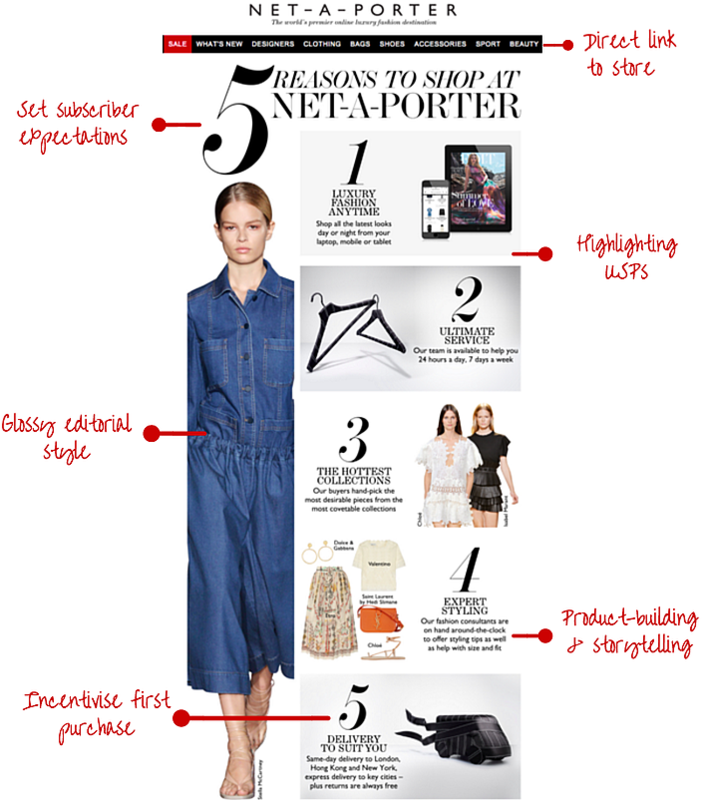 “5 reasons to shop” messaging directly highlights the key USPs behind NET-A-PORTER’s brand. A welcome email is a great opportunity to drive new subscribers to your preference centre to capture their unique preferences. This enables you to align their email journey with your brand to ensure you’re always delivering targeted content of interest, so they don't tune out at a later date. 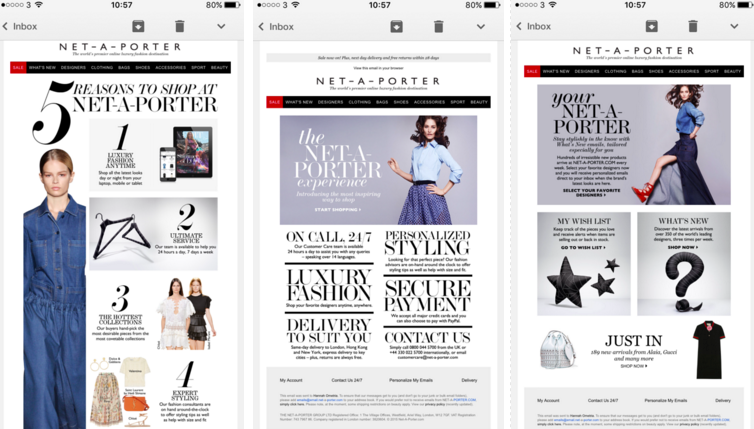 Email copy highlights the scale of NET-A-PORTER’s unique offering, encouraging subscribers back on-site. Double ‘shop now’ call to action to help win that all-important first purchase. Inviting users to sign-up for more updates is a clever way of gleaning more data to improve targeting as your relationship evolves. 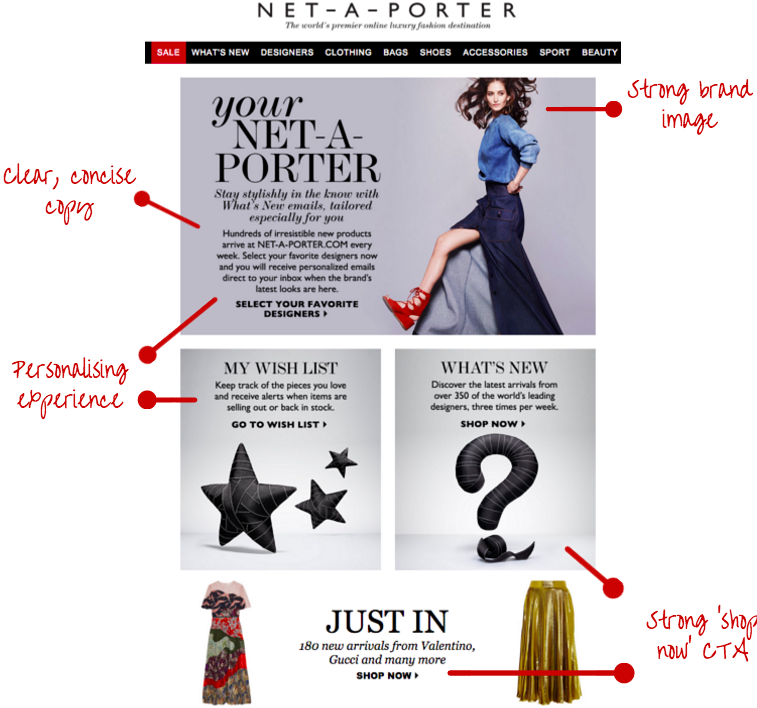 This email is packed with clear, relevant and interesting CTAs - introducing NET-A-PORTER’s amazing online content, extending brand personality and essentially driving eyeballs to their website. The social connection. It’s essential to promote your social channels, helping you diversify your delivery across multiple channels to keep users engaged and your brand’s figurative fingers in many pies. 'Porter Magazine' brings brand offline and brand name on to the coffee table. MR PORTER cross-promotion through the CTA "shop for him" - likely to appeal to the gift-buyer. 'The Net Set' social app driving prospects on to a different channel, tapping into burgeoning social commerce/app trend (in-app purchases estimated to hit 14 billion US dollars worldwide in 2015). Consolidation of welcome email series, nicely underlines the brand's key selling points and benefits. Great copy enagages reader and encourages click-through. Contact section (literally) links straight to customer care (it will start dialling, beware) which is a great extension of the retailer's customer service. Subject line reaffirms NET-A-PORTER’s focus on customer service. Strong shopping CTA emboldened by strong imagery. Being ready for mobile is nothing new. But many great emails built on desktop don't work on smaller devices, so be aware. According to BlueHornet, 67,2% of consumers use a smartphone to check their email, while 42,3% use a tablet. If you’re not optimised for mobile, you’re not going to survive (UK shoppers spent an estimated £15 billion via mobile devices in 2015, an increase of 77.8% on £8.41 billion in 2014). NET-A-PORTER’s relatively data-heavy messaging displays beautifully on smartphone, putting their store in the hands of millions of hungry shoppers. It's also important to keep in mind that, as mobile screens are smaller, your subject lines shouldn't be too long (character limit: 30–35). 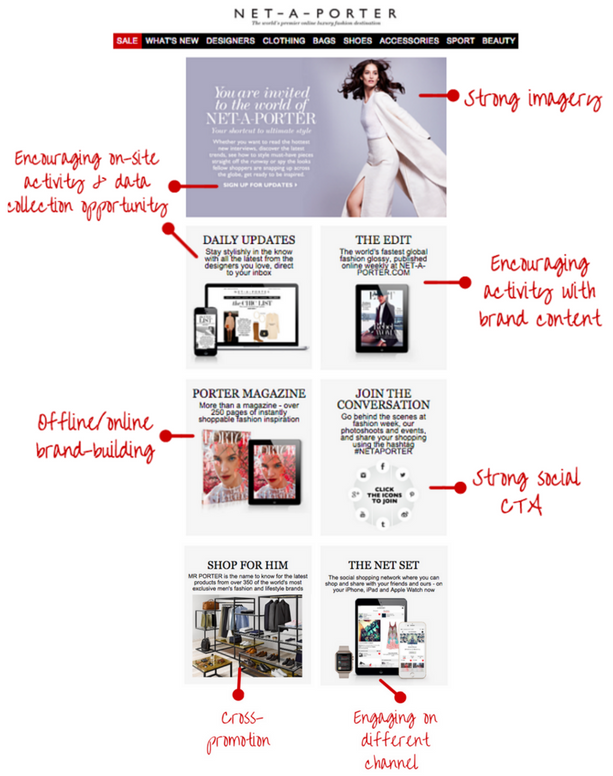 Drawing inspiration from NET-A-PORTER, your next welcome series should include many sides to your personality, with consistent branding, easy navigation and many CTAs that get your new subscribers off-email and on-site. Email 1: A quick thank you and brand introduction. Outline your brand story, company history, and social media profiles. Always display product breadth and try to incentivise a first purchase - perhaps offering a discount ("10% welcome discount"). Email 2: Exclusive content. Set new subscriber expectations about future email content, showcase product range and highlight promotions and brand USP. Email 3: Cross-channel email establishing social connections. Email 4: Remind them of their discount, free shipping or similar offer you extended in the initial welcome - triggered after "X" number of days and sent to those that have not purchased. Email 5: Invitation to fill out a customer profile with demographic information to glean more data to help future communications remain relevant. Email 6: The last hurrah. *Special offer* for subscribers who have not opened or clicked a single email after a certain number of messages. Every journey begins with a single step and building brand loyalty starts with your very first interaction. A welcome series presents a key opportunity to highlight your product range, showcase your brand story and reinforce your greatness - to ultimately bring new subscribers back onto your website (and onto the buy button). Differentiate your welcome series from your regular messages, and coordinate with regular emails to avoid spamming (and the unsubscribe button) and don’t wait to introduce yourself. Real-time welcome emails see more than 10x the transaction rates and revenue per email over batched welcome mailings. Never forget to optimise for mobile, with mobile readership continuing to rise, welcome emails should be easy to view and interact with on mobile devices. Finally, never waste an opportunity ask for your subscribers specific email preferences to tailor future mailings. Relevance is always king.